Apparently, I'm all about the covers lately. But don't these three look great? I've only read one of these authors before, but all three covers (and synopses) have me interested and excited. Quite different in tone, they each represent an upcoming young adult contemporary fiction title currently residing on my list. You know how much I loved Donna Freitas' This Gorgeous Game , and I have pretty much been looking forward to the release of this book ever since. I love the juxtaposition of photo and drawing on this cover, as well as the great font and title spacing. When Rose's mother passed away, she left her a brown paper bag "survival kit" to help her daughter get through the loss. As she ponders each item, she moves closer to that goal. Also, there is a gardener/hockey player named Will. Sign me up! I've not read Ms. Alexander's previous novel--The Sweetheart of Prosper County --but I've read the rave reviews (and love the title) and it is on my TBR. This one has an entirely sexier different look going for it. Paisley Tillery (I know, right?) is a drummer in a rock band in a small Texas town she's dying to break out of. Enter a singer from a town called Paradise and things become . . . complicated. Can you believe this cover? I just want to hang it on the wall. Shades of the exquisiteness that was the cover of Marcelo in the Real World . This is Ms. Sloan's debut novel, and it follows a boy named Sam and his younger brother Riddle who, after a lifetime of being on the move, meet a girl and her family who welcome them into the normalcy they've always craved. I hadn't heard of The Survival Kit but it sounds amazing, I will have to check out The Gorgeous Game too. I've seen both The Survival Kit and I'll Be There covers before and I adore them. Nice picks. These are wonderful covers. They sound interesting. All of these covers are beautiful. I just put The Survival Kit on my to-read list. Thanks for the heads up about The Survival Kit. I enjoyed This Gorgeous Game as well. 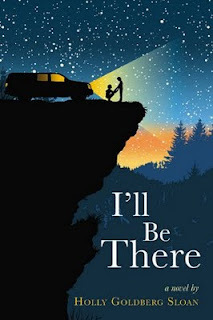 I picked up I'll Be There this past weekend because of the beautiful cover, and devoured it in two days. It's an amazing book... one of the best I've read in a while. I'm currently trying to get everyone I've ever met to read it!